UPDATED 4TH MARCH: Due to the amount of requests to have this article translated into English, we have done so and it can now be found at the bottom of this post. We hope you enjoy it. Tim Rice-Oxley participaba esta tarde en una charla en UCLU (University College London Union), universidad donde él mismo cursó sus estudios. Al hablar de sus inicios con la banda, Tim ha recordado que sus primeros conciertos no fueron exactamente multitudinarios. Incluso ha bromeado con un concierto en Peterborough, donde prácticamente no había nadie. Tim ha reconocido que la industria ha cambiado bastante desde los inicios de Keane hasta ahora. Pero que ellos siempre creyeron en lo que hacían y lucharon por ello porque, de alguna manera, sabían que iban a triunfar. Ha dicho sentirse orgulloso de ‘Bedshaped’, ‘Atlantic’ y ‘Spiralling’. Sin embargo, ha comentado también que si hubiera madurado algo más ‘Pretend That You’re Alone’, no la habrían incluído en Perfect Symmetry. Se confiesa enamorado del artwork de ‘Under The Iron Sea’, pero sin renegar del que se eligió para ‘Hopes & Fears’, por ser el que de alguna manera los dio a conocer. Ha comentado también que para él, es una gran satisfacción que algunas de las canciones de Keane se incluyan en bandas sonoras. Al preguntarle por Tom, ha dicho que nunca tuvo envidia de él por ser la cara visible de la banda. Y que si alguna vez la había tenido, no lo recordaba. 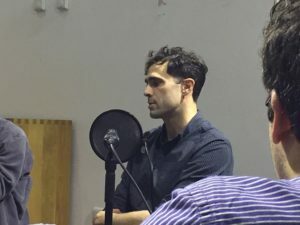 Sin embargo ha reconocido que para el cantante, alguna vez resultó frustante no sentirse más involucrado en la composición de las canciones de Keane. Con la ayuda de Adam, se han expuesto algunos consejos muy útiles a los alumnos asistentes sobre cómo promocionar la música de los nuevos artistas, cómo superar los miedos al directo y cómo conseguir desarrollar una carrera componiendo música. Ambos han reconocido la gran influencia que tienen la redes sociales en la actualidad. Y han citado Spotify como un excelente medio para que los artistas noveles puedan darse a conocer. 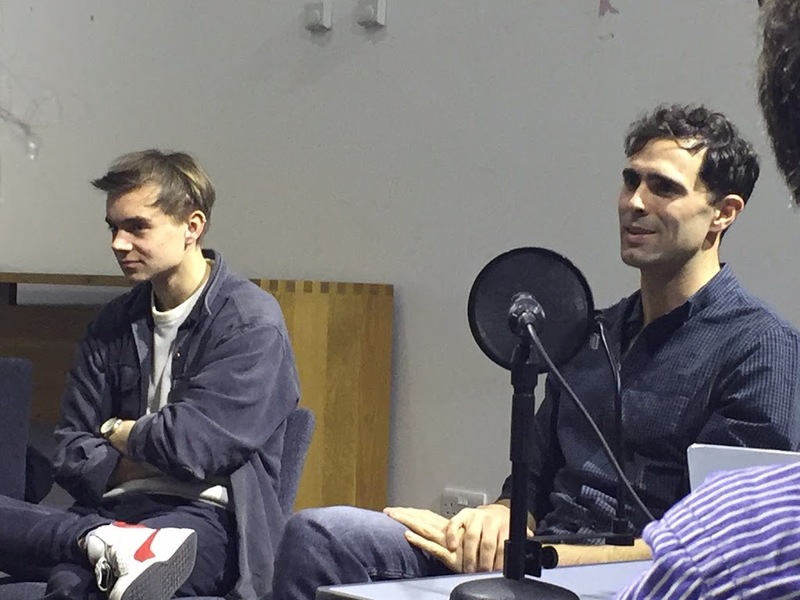 Tim Rice-Oxley visited this afternoon UCLU, the Union at the university he attended, for a chat with music students. Joined by Adam Tudhope (manager of Keane), both discussed some key matters to succeed in the difficult current music scene. Keane’s songwriter was introduced as ‘Previously with Keane… well, still with Keane, aren’t you?’, to what he answered , ‘Yeah, still’. Discussing the beginnings of the band, Tim reminisced their first gigs were not very crowded. He even explained (between laughs) how a gig in Peterborough had literally no one in the audience. Tim admitted the business has changed dramatically since the beginnings of Keane till now, but they always believed in what they did and they fought for it because, in some way, they did know they would make it. He confessed himself proud of ‘Bedshaped’, ‘Atlantic’ and ‘Spiralling’. However, he admitted if the decision had been more mature, he would not have included ‘Pretend That You’re Alone’ in Perfect Symmetry. He also admitted he loves the artwork for ‘Under The Iron Sea’, and although not great, he is fond of the one for ‘Hopes & Fears’, for which they became known. As a songwriter he confesses it is a matter of pride to have their songs included in soundtracks. When asked about Tom, Tim thinks he was never jealous of him being the face of the band, and if he ever was, he cannot remember it. 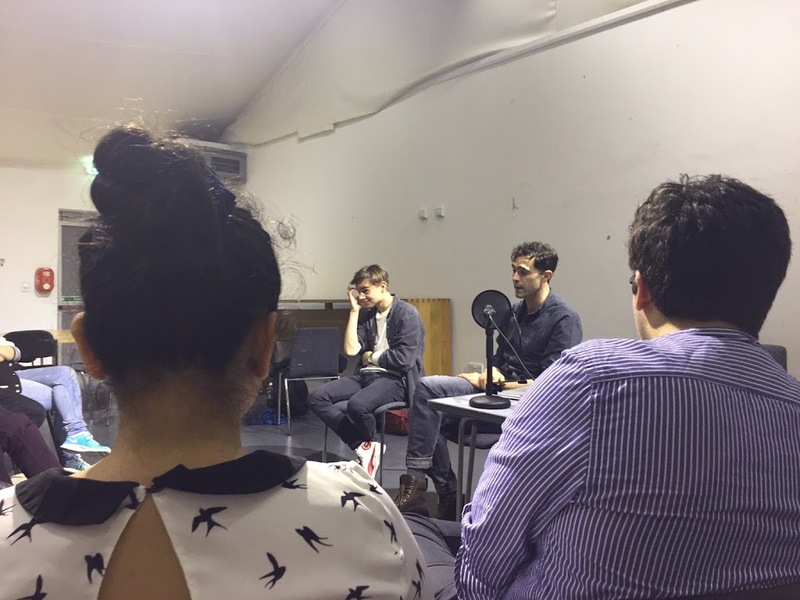 However, he did think Tom had felt frustrated sometimes singing songs where he had not had any input in the writing. 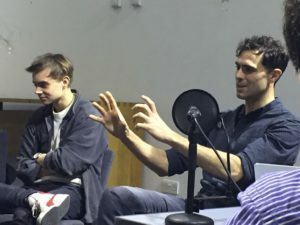 With Adam’s help, they have both given very useful advice to the attending students on how to promote new artists’ music, how to overcome stage fear or how to develop a career in songwriting. They have both admitted the inmense influence social media has these days, and mentioned Spotify as an excellent channel for new artists to release their music and get exposure. We leave you with a couple of very short videos, which we realise won’t be enough for the fans, but we trust you will understand it would not have been respectful to film anymore. Contenidos: Elisa E / Maria Z / Patricia C.